The Triple-E is not only the largest ship in the world, but also one of the greenest on the seas today. It emits three grams per tonne of goods per kilometre, which is much less than the average container ship emissions of 10 to 20 grams. Jacob Sterling, Head of Environment & CSR at Maersk Line, points out that alternative modes of transport for long distances, such as air freight, are far less environmentally friendly. "Ocean freight is the most energy-efficient way of moving goods. You can't get such economies of scale with trains, trucks or airplanes." 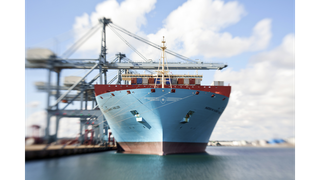 Maersk's goal was to make a ship that was 30 percent more energy and cost efficient than its previous ships. A long-term perspective was applied, says Heimann. "We applied the same line of thinking as when investing in, for example, low-voltage light bulbs," he says. "You pay more initially, but get longer lifetime and a lower electrical bill and since fuel prices are unlikely to fall, this approach makes for a better business case." 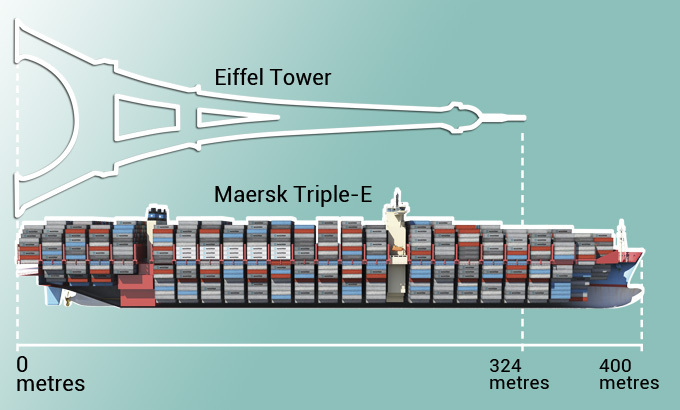 Economies of scale were applied to the Triple-E: the more containers that fit in, the more efficient the journey. Achieving such a high capacity required some design adjustments. The Triple-E’s hull, for example, is U-shaped and more spacious than traditional ships to accommodate one extra row of containers. The engine room was put at the rear of the ship, instead of in the middle, which is the traditional solution. “By doing this, we are able to fit in more containers behind the navigation bridge and in the hull. It might be a little inconvenient, due to a longer passage to the engine room, but it’s not what we consider a problem,” says Heimann. A waste heat recovery system, which uses Alfa Laval boilers, helps propel the ship by capturing energy from the engine’s exhaust gas. This cuts fuel by up to 10 percent. The energy is also used to, among other things, produce electricity for the onboard accommodation. The waste heat recovery system has allowed the Triple-E to use a smaller and less energy-consuming main engine. The Triple-E has a “twin-skeg” propulsion system with two engines driving two propellers. The ultra long-stroke engines in the twin-skeg configuration operate with a lower number of revolutions compared with a traditional engine. This system will generate further energy savings of 4 percent compared with a single engine and propeller system. The new vessels also include Alfa Laval’s PureBallast 3.0, which is the latest and most effective version of the water treatment system that uses UV light to protect against the threat of invasive species. Meanwhile Alfa Laval’s Aqua freshwater generators use vacuum distillation to convert seawater into high-quality freshwater. Compared with the industry average, Maersk is already more fuel efficient, emitting 10 percent less CO2 in 2012 than the competition, which adds up to a total savings of 2.1 million tonnes of CO2 for all Maersk Line’s customers." "We are continuously learning about technologies and developments that can make the next project even more efficient and environmentally friendly. It's amazing how much was achieved on the Triple-E with existing technologies in terms of CO2 reductions. Imagine when we start using solar, biofuels or other alternative energy sources. With more breakthrough development on the renewable energy side there will be so much more to come." Ocean freight is the most energy-efficient way of moving goods. You can’t get such economies of scale with trains, trucks or airplanes. ..that airfreight emits about 500 grams of CO2 per tonne of goods? Using rail transport for the Triple-E's 18,000 containers would require the rather unfeasible option of having a 110-kilometre-long train. ..that the 400-metre-long, 59-metrewide vessel has a speed of 18 knots, with its cargo packed efficiently into 18,000 containers. E.